Did you know that nearly 1.4 billion employed people live on less than $1.25 a day? 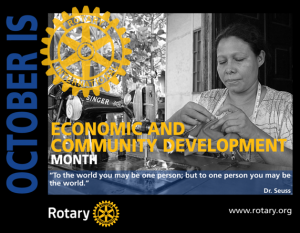 Through worldwide projects, Rotarians are working to promote economic and community development and to reduce poverty in underserved communities. Training is made available, well-paying jobs are helping to be established, and equipment is being provided to help strengthen local areas in need. The Rotary Foundation has learned that investing in people pays dividends. The creation of sustainable, measurable and long-term economic improvements benefits everyone. Metro has supported local and international projects that have helped countless people. Generating income and opportunities for entrepreneurship and a productive workforce is essential, along with education and health strategies, to reducing poverty. Every community has different needs and different opportunities to serve. If you have an idea or would be willing to share your expertise in assisting our club to help others with economic or community development-related projects, please talk to one of our club officers or Service committee chairs. Together, we can make a difference.